If BODYLINE BORDERLINE takes your breath away, perhaps you can thank the fact that it takes the dancers’ breath away. Computer vision in dance is now an accepted trope, to the point of being nearly cliché. The challenge is in part that the human eye’s capacity to follow nuances in movement contrasts to the crude capabilities of even the most sophisticated digital systems. But there are also opportunities for new angles on the material. Whereas so much dance with vision has focused on sparkly wonderlands of particle effects and the like, blissful mirror amusement parks, BODYLINE BORDERLAND has a different message. Angry, impatient digital overlays both watch and exhaust the dancers, spotlights and instructions in sharp contrast. To me, these are dancers in a surveillance state, chased by the vision tracking and completing robotic actions. It’s the perfect modern foil to the clock machine in Metropolis, remade for the NSA age. 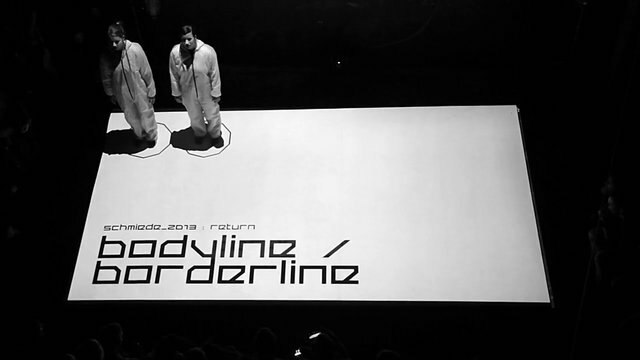 BODYLINE BORDERLINE Performance – Schmiede 13 from michaelias on Vimeo. But even without that programmatic interpretation, the dance itself is a terrific spectacle. The jittering visual overlays drive the dancers to push themselves to their limits, and the appreciation from the audience is palpable even in the video. This is, then, real performance and not just dancers going through the motions; the simple top-down visuals also give you the feeling of the dance space as a place that brings the live artists to that edge. This performance was developed and realized during the Schmiede 13:Return festival. It deals with physical and medial excessive demands and exhaustion.